December has been quite busy for What's Good to Do reviews and we have had quite a few fun reviews to do. 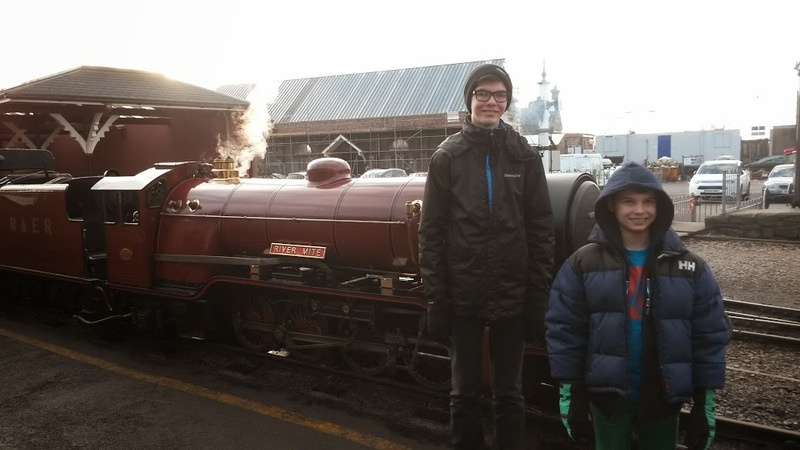 The latest one we did was the Ravenglasss railway which was a fun day out, we originally planned to go on my birthday but the forecast was snow so we didn't fancy driving up to the Lakes if the weather was going to be bad bad so we delayed it by a day and had a lovely crisp December day out. We set off for our day out in the Lake District between Christmas and New Year. The day was cold and frosty but clear as we drove north on the M6. Ravenglass is on the west coast of the Lake District and is an area that we don't normally visit so we were looking forward to our trip. Having such a bright clear day meant we had great views of the snow-capped mountains and had a very pleasant drive up. Before we left we checked the website and found that both steam and diesel engines were running, we were aiming to get there for the 11.30 steam train but our sat nav took us via the scenic route - ordinarily this would have been a good idea but given the amount of ice on the roads it did lead to a slight delay, on reaching the top of a hill we decided that we wouldn’t risk driving down the other side which was still in the shade. The single track road was still covered in ice and we didn’t fancy sliding down the hill! We turned round and re-joined the main road and arrived at the car park just as the train left the station. The next train was a diesel train so we opted to wait for the next steam train which gave us time to explore Ravenglass and have some lunch. There are the remains of a Roman bathhouse nearby so we took a quick stroll to take a look and then walked back via the beach and returned to the station for some lunch. The station cafe serves a good range of reasonably priced food and drinks, we chose a hot beef sandwich, beans on toast, a baked potato and some soup. Everything was freshly made and tasted delicious. Also available is a range of food and drinks to take away - a good idea on a frosty train ride. The station itself is very clean and tidy and was very tastefully decorated with Christmas decorations. We last visited about 7 years ago and I remember the station had lovely hanging baskets so they take a lot of pride in the look of the station. The toilets on the station were very clean too. Opening this spring is a new museum area, although this was still a building site when we visited. There is a large car park at the station with parking costing £3 per day. Whilst you can’t consume your own food in the cafe there are plenty of benches dotted around the station for you to sit and eat a picnic. There is also a good playground at the side of the station that will keep children entertained whilst waiting for the train. All the staff we talked to were very helpful and knowledgeable. 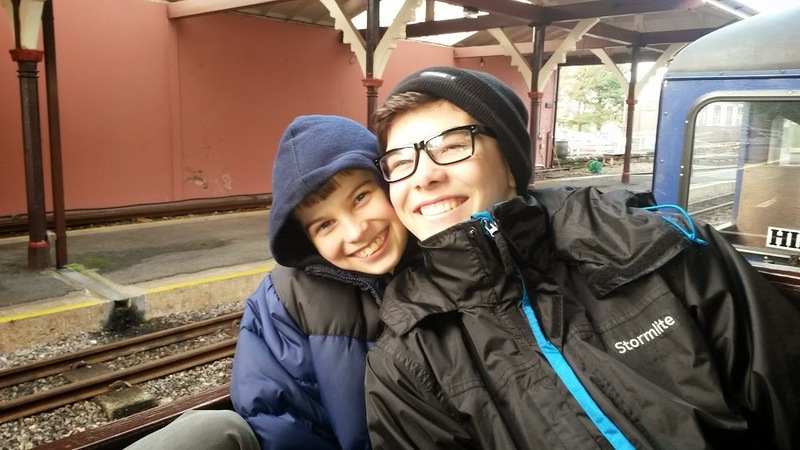 Once the train arrived at the platform we chose an open air carriage, most were covered but we wanted the full steam train experience! I did think we might be the only people mad enough to sit outside in the freezing cold but a number of other people sat in the open carriages too. We had wrapped up well with plenty of layers and hats and gloves so the journey wasn’t too cold, although with hindsight a blanket would have kept our legs warm. The 15 inch minimum gauge line winds its way for 7 miles through the beautiful Eskdale valley up to Dalegarth station near Boot. In an area popular with walkers many people choose to take the train one way and walk back or to pick up the train at one of a number of request stops on the route. There is another cafe at Dalegarth so you could break your journey with a drink and snack before returning to Ravenglass. With the weather being so cold a number of passengers bought warm drinks for the return journey. We changed to a covered, heated carriage for the return trip which was warm and comfortable however you do not see as much as you do in the open carriages. There are plenty of sheep in the fields and the scenic mountains in the background and I’m sure that when the weather is warmer you will see plenty more birds and wildlife. There was a real mix of people on the train, young families, older couples and even a couple of dogs. This really is a day out that appeals to everyone, young or old. We had a great day out and won’t be leaving it as long to visit again.